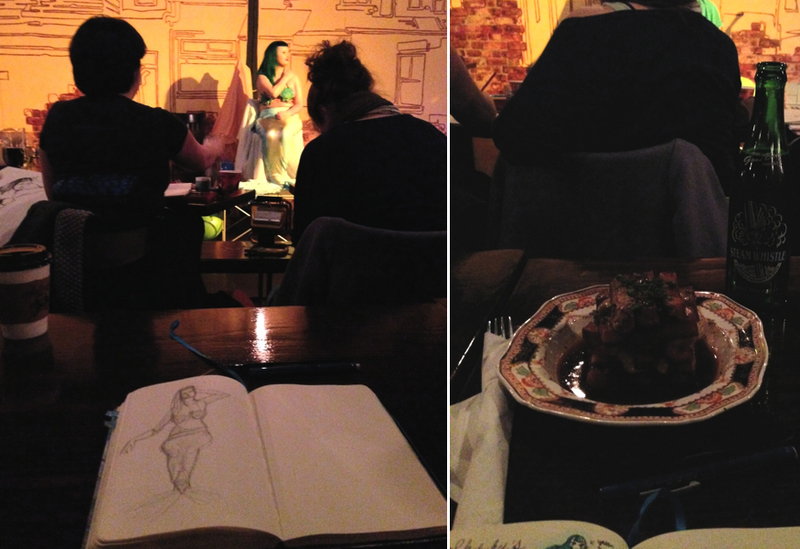 I finally got a chance to attend a Dr. Sketchy event in Toronto. The new organizers recently started these unique life drawing sessions in Toronto after a 3 year hiatus. The drawing sessions are held at Round Venue located in the Kensington Market. It's my second time at this venue for a sketching event and I like it, it has a really nice vibe. Our burlesque model this time was Cassia Sparkle : the living mermaid. She brought three wardrobes and posed for three hours. I was able to produce a lot of sketches that night and added color later on at home. It's definitely something I'm going to try to do on a regular basis. The organizers also ran a couple sketching contests during the breaks and winners were able to get a couple fun prizes. The caliber of artists attending this event is quite impressive. I only had time to do some pencil sketches, while others had fully colored rendering of the model and great cartoon versions of her.